When we bought this house, we were told by our new neighbor that the little room attached to our master bedroom was a full bathroom at some point. I realize I have a problem with organization. Anyway, we are lucky enough to have the original blueprints for the house, and it appears that this 4' x 5' space used to have a sink....and a closet rod. Not sure what was popular in the 30's, maybe they liked to splash their armpits quickly before getting dressed? Either way, it doesn't appear that it was ever a two piece washroom, let alone a full one. While I would've loved a half bath attached to the master, we decided to leave it as a closet to avoid an expensive 'can of worms.' It had some laminate floors, not sure if it used to be tile back then? This room also has drywall while the rest of the house is plaster, so something happened in here. We pulled out the laminate in anticipation of our floor guy adding new red oak to match the bedroom. The transition turned out beautiful! It looks like it was always there. Of course, I already have a bunch of junk back in there. Research, purchase, install closet system. Any suggestions? What a great space to have! I laughed out loud at the armpit comment and can totally picture it. 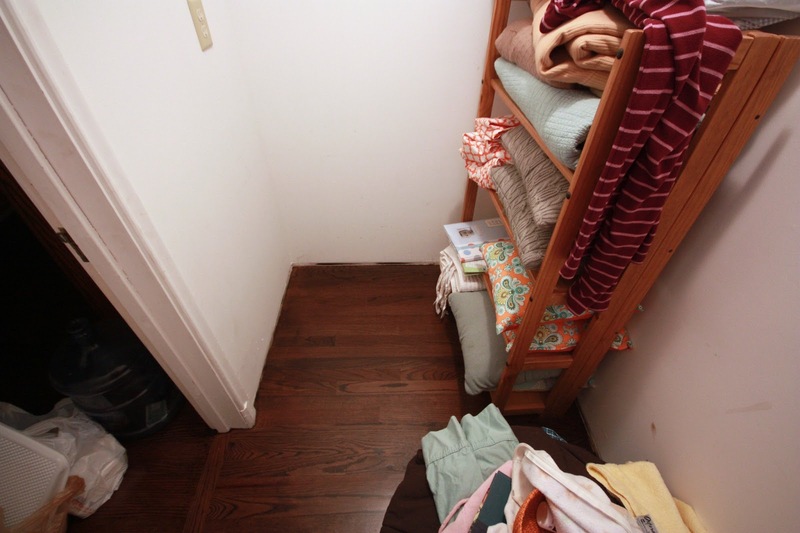 We used the Martha Stewart closet organizing system and we've been very happy with it. Two years later it still functions well and it looks perfect. I wasn't surprised to hear there had been a sink in that not-bathroom at one time. One of our bedrooms in our 1920 House has just a sink on the wall next to a closet. Previous owners (small town, we still see the last 2 owners around) have all said they dreamed of making the not-small closet on the other side of the wall with the sink a bathroom with a shower/toilet, but never had the money to do the task. This dream has been added to my "if/when I have money" list as well! So cool you have the original blue print to your house!! We'd love to have the original framed in our house, I'm thinking of framing our new one. Back to the closet, I've seen the Allen & Roth brand at Lowes that looks nice, the Ikea closet look so confusing. We are also looking for a closet system for our Master...I'm going to check into the container store and see how affordable they are. Cant wait to hear what you decide to go with. Don't buy the Homie D's closet system. I did and it was awful. The holes don't match and too close to drill my own. BLEK! So glad you're doing another project. The floors look beautiful! I giant-puffy-heart the ELFA system at the Container Store. Not the cheapest option but they have a 30% sale every January which makes it a little easier to stomach. We should have a useless room competition. 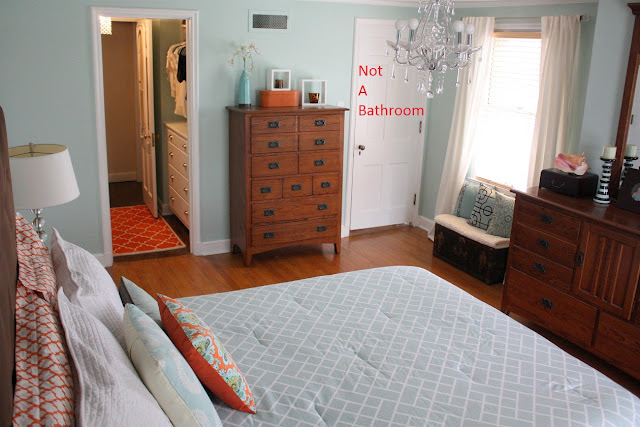 Your "not bathroom" and our "skinniest closet ever." Seriously, what were these people thinking? Ditto what Carrie said. I couldn't love our new ELFA system more. It was not cheap, but it's so easy to install and customize! Good luck! Damn. I would love to have an extra little space to hide things away in. Or stash the dogs! They could have their own bedroom!